FREE + Profit Cereal At Price Chopper! 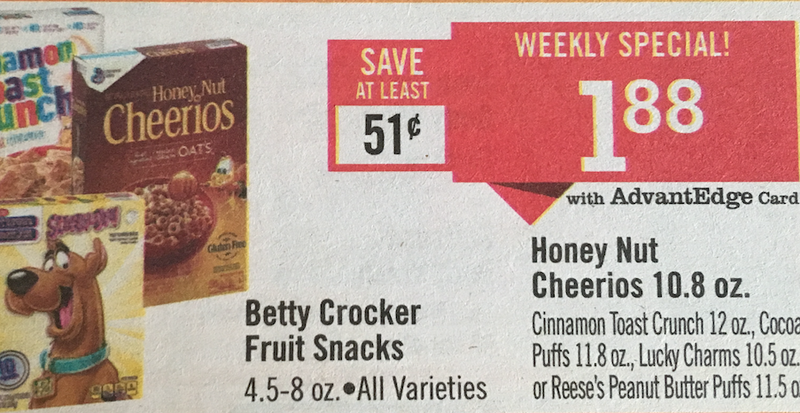 Todays new cereal coupons make for a great deal this week at Price Chopper! = 4 FREE + $0.48 Profit! 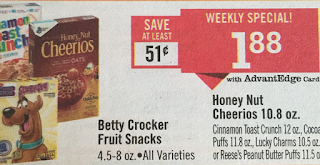 + saving star Save 50¢ when you buy ONE (1) BOX Mott's® Fruit Flavored Snacks OR Mott's® Fruity Rolls..Expires 8/31/2018.Save $0.50. + saving star Save 50¢ when you buy TWO (2) BOXES any flavor 15 COUNT Totino's™ Pizza Rolls™ Snacks..Expires 8/31/2018.Save $0.50. plus use saving star Save 50¢ when you buy TWO (2) any flavor/variety LÄRABAR™ bars..Expires 8/31/2018.Save $0.50. plus combine w/ saving star Save 50¢ when you buy TWO (2) PACKAGES of any Annie's™ Mac & Cheese..Expires 8/31/2018.Save $0.50. Save $1.00 when you buy ONE (1) BOX of any Annie's™ Organic Cereal..Expires 8/31/2018.Save $1.00. plus combine w/ saving star Save 50¢ when you buy TWO (2) BOXES of any Annie's™ Organic Fruit Snacks..Expires 8/31/2018.Save $0.50. plus combine with saving star Save $0.50 when you buy ONE (1) BOX of any Annie's™ Organic or Gluten Free Granola Bars OR Crispy Snack Bars..Expires 8/31/2018.Save $0.50. plus saving star Save $1.00 when you buy ONE (1) PACKAGE any flavor/variety Cascadian Farm™ Cereal or Granola..Expires 8/31/2018.Save $1.00. plus use saving star Save $1.00 when you buy ONE (1) any flavor/variety Cascadian Farm™ product listed: Granola Bars, Protein Bars, OR Oatmeal Squares..Expires 8/31/2018.Save $1.00. I purchased 2 boxes of Cheerios and 2 boxes of cinnamon toast crunch today and the catalina coupon did not print. Did the offer end at the end of July? Thanks for the information Lisa! I will call tomorrow.